Kukicha green tea is made from a mixture of sencha leaves and stalks, resulting in a sweeter character. It produces a green liquor with a grassy aroma. The verdant sweet profile has satisfying toasted notes and a slightly savoury aftertaste. Kukicha (茎茶) is an unusual green tea from Japan that is made from sencha tea leaves as well as leaf stems that are removed during the production of sencha. As it is made with the stems, it’s also known as ‘twig tea’. The inclusion of the parts of a tea plant that are normally excluded from sencha tea production results in a unique sweet yet grassy flavour that you are bound to love! This tea comes from Makinohara in Shizuoka Prefecture and is made from Yabukita cultivar. 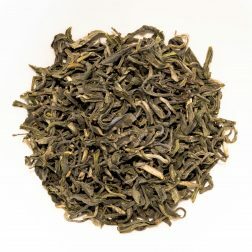 It is a second flush tea, this particular batch was harvested in May 2018. 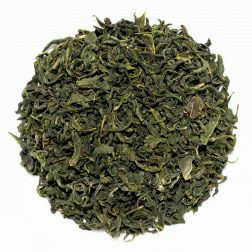 This Kukicha is a mixture of dark green sencha leaves and yellow stems. The liquor is a pale yellow-green colour with a toasted grass fragrance. 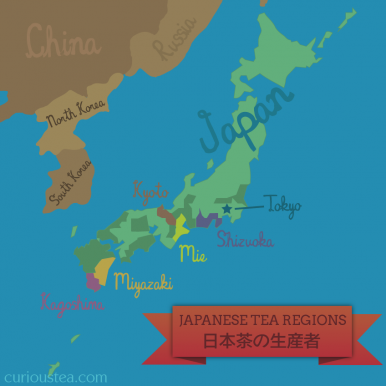 This tea has a smooth and balanced taste that is toasty and grassy. It has sweet juicy middle notes and a slightly savoury aftertaste. The sweetness comes from the higher sugar content of the stems and is completely natural. Kukicha green tea is best brewed at 70°C for 1-2 minutes, with multiple infusions. Kukicha can also stand longer infusions well, resulting in a sweeter and more intense flavour. 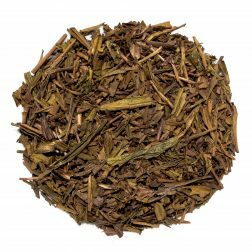 This Makinohara Kukicha green tea was first featured in our December 2018 Curious Tea Subscription Boxes.